Spring is here and it’s time to get your Utah lawn in tip top shape. There are many different landscaping ideas and techniques that you can use to compliment the size and shape of your yard. Whether you need a new lawn, or some decorative curbing or even a rock retaining wall, we do it it all. 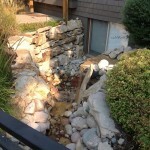 Don’t forget to check out our value adding water features as well. Why Have A Sprinkler System Installed? You take pride in your yard, and it serves as the first impression that your neighbors will make about you and your family. While you likely understand the many benefits of an aesthetically-pleasing lawn, life can be busy. It can be difficult to maintain a yard with so many other responsibilities. Considering the installation of a sprinkler system is the first step toward the yard you deserve. The investment in a sprinkler system is one that will pay you back in more ways than you likely considered. While the time saved is obvious, you may not have realized that it can also save you money. Our sprinklers only disperse the amount of water your yard needs to thrive. This allows you to do your part in water conservation while decreasing your water bill. If you want to enjoy homegrown fruits and vegetables but are not home enough to properly care for growing plants, a sprinkler system is your answer. 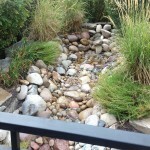 We can install a system that will take care of your garden for you while you take care of your other responsibilities. Your days are busy, and, when you arrive home after a long day on the job, you owe it to yourself to be greeted by a healthy lawn full of life and vitality. The solutions you need is just a phone call away, so contact us today! 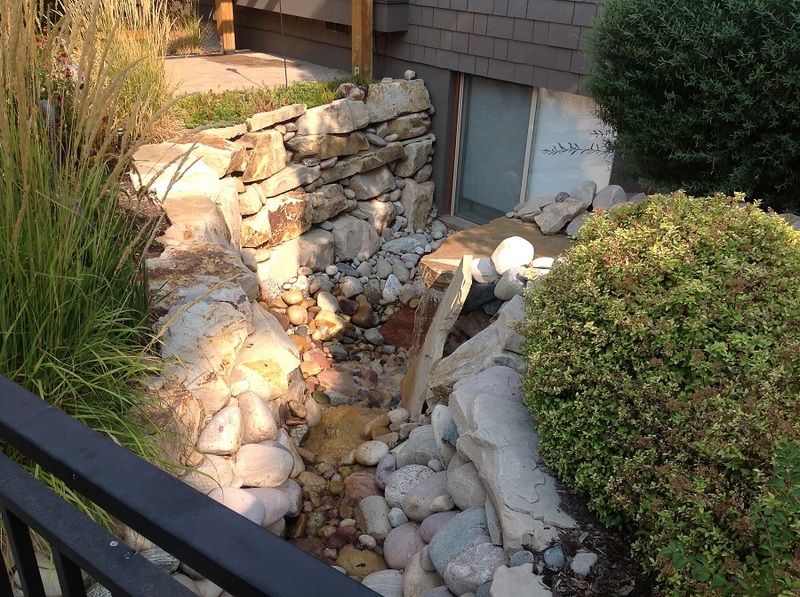 CALL RIDGELINE LANDSCAPING FOR YOUR FREE SPRINKLER INSTALLATION ESTIMATE TODAY! 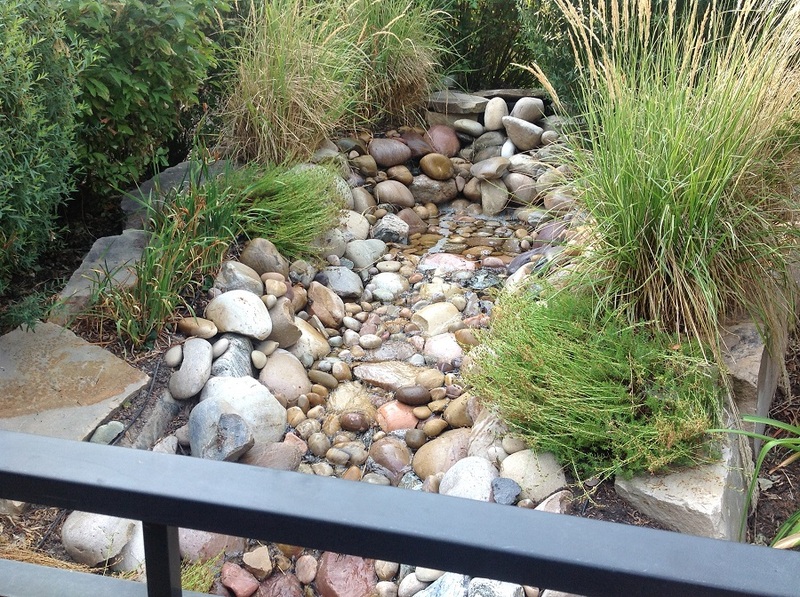 In this custom landscape we have created a great view out of the basement window with the bridge over the waterfall and flowing stream. What a great way to relax and enjoy your yard. 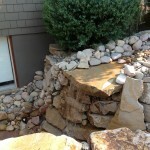 Call Dirk to get a FREE Quote for your home and enjoy the results. 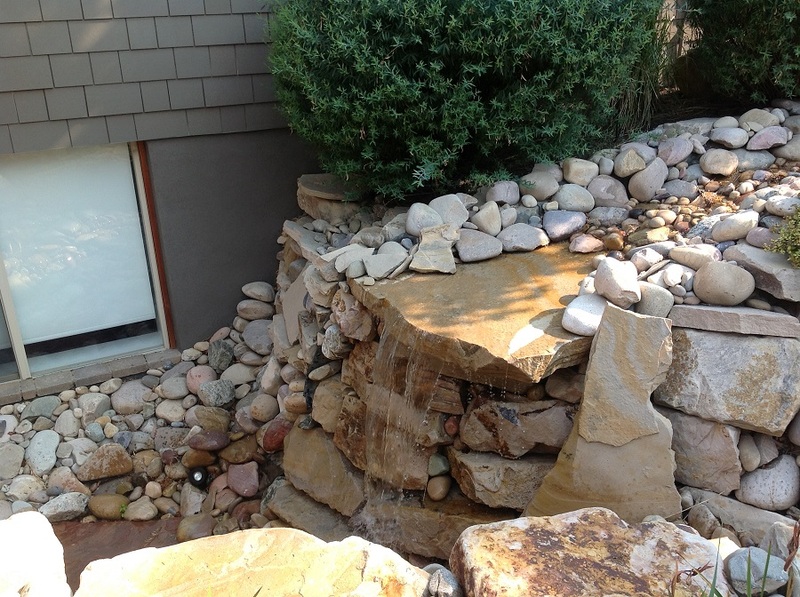 Have you ever considered a waterfall, stream or a pond in your backyard. 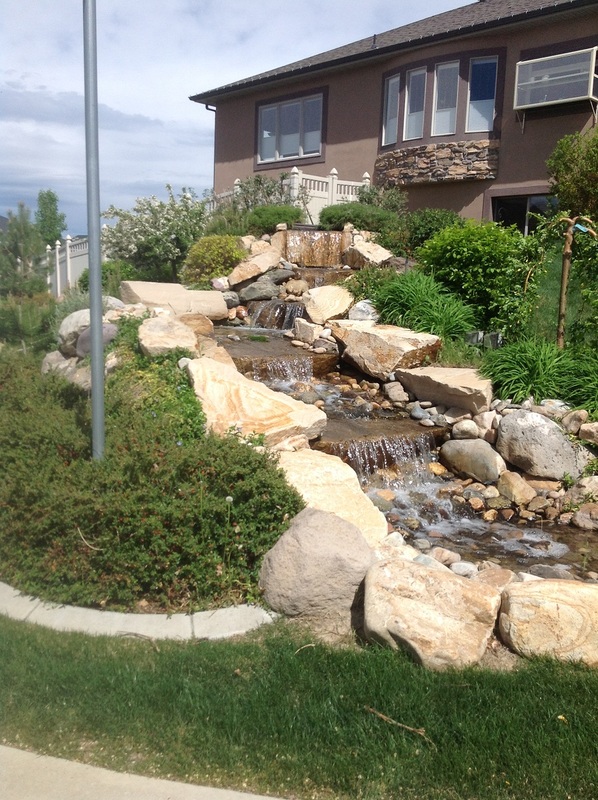 Ridgeline Landscaping has been designing custom water features for many years in the Salt Lake City, Park City and Draper areas. Take a look at a few, get your mind racing and give us a call for your custom landscape design specifically for your home. So you’ve done a good job by adding a sprinkler system to your home. Cold temperatures in Utah are just around the corner. It’s time to winterize your system so it doesn’t burst from the cold. We can help and do it at a very affordable price. Until recently, traditional landscaping techniques involved most of the yard being lawn grass with a few shrub, trees and flower beds scattered about for added interest. However, many homeowners are moving away from large lawns and other high maintenance landscaping in favor of native plants, alternative ground covers and container gardening. For instance, proper lawns take a good deal of time and money to maintain, and if can contribute significantly to a negative appearance if they are no neglected. Many people are choosing to use other types of vegetation or even materials such as concrete, gravel or bark dust as ground covers. The most popular modern landscape technique is to make practical plantings into attractive fixtures. For instance, homeowners used to hide their culinary herb gardens in the out-of-the way areas of their yard, and for years, hardly anyone grew them at all. Now that homegrown culinary herbs are enjoying a well-deserved comeback, it is not at all uncommon to see them prominently featured in large, aesthetically pleasing outdoor planting containers. Many people are also beginning to plant fruit trees instead of their purely ornamental counterparts in both their back and front yards. Miniature and even dwarf species of fruit trees exist for those whose yards are not large enough for standard sized trees. Modern people are rediscovering the satisfaction of growing at least a portion of their own fruits, vegetables and herbs, and this trend is well-represented in current landscape designs. If you have recently moved into a new home that needs some landscaping done in the front yard, you may be in need of some good design ideas. The latest landscape design trends have moved away from planting shrubbery up against the foundation of the home. This practice is considered a safety hazard in areas where fire danger is high, and is discouraged in other locations because dense shrubbery provides rodents with places to hide. Planting perennial and annual flowers around your foundation is a great way to add color and interest to your yard without having to deal with the hassle of having shrubs. Other current design trends reflect an interest in incorporating edible landscaping into the front yard vegetation, increased use of native plants and a move away from traditional lawns. People want to go into their yards on summer mornings and return with something delicious to eat while they drink their coffee or tea, and they don’t want to spend entire weekends tending a yard full of lawn grass. The latest design trends also reflect the growing movement toward urban farming. Large tubs with thriving culinary herbs spilling over the edges are the latest front yard accessory of many urban homes. We’re sure you have better things to do than be outside on the weekends cutting your grass. Here at Ridgeline Landscaping, we offer competitive pricing on landscaping services to Salt Lake City and the surrounding communities. Making your lawn beautiful and attractive does not mean that you need to spend a lot of hours on it. With a professionally installed home sprinkler system, your lawn becomes the envy of your neighbors. Here are a few of the many benefits of having a home sprinkler system. Installing a home sprinkler system does not only help make your lawn and landscape beautiful and attractive, but also help you save water. The sprinkler system disperses the right amount of water on specific garden and lawn areas, ensuring that the water is not wasted. This is the biggest advantage that people felt by owning a home sprinkler system. Since the system is automatic, homeowners no longer need to spend their valuable time in moving hoses around their yard and watering their plants and landscape by hand. With a home sprinkler system, there is no more dragging hoses; no more forgetting that the hose is running; no more asking or paying someone to water your lawn while you are away; and no more worrying if lawn has been watered or not. It is automatic and reliable. A home sprinkler system comes with an indoor or outdoor controller. Some automatic sprinkler systems even come with a rain sensor. This allows you to leave your home for a few days without having to worry about your landscape or lawn if it has been watered or not. It extends the life of your lawn. Since the sprinkler system is automatic, your lawn and landscaping beds are ensured that they are watered regularly even if you are not at home. This makes your grass and plants look healthy and attractive. It makes a good investment. Many homeowners who have a sprinkler system believe that it is a good financial investment. A professionally installed sprinkler system not only helps them save energy and money but also helps add value to a home.